View More In Monitor Accessories - Page 2. 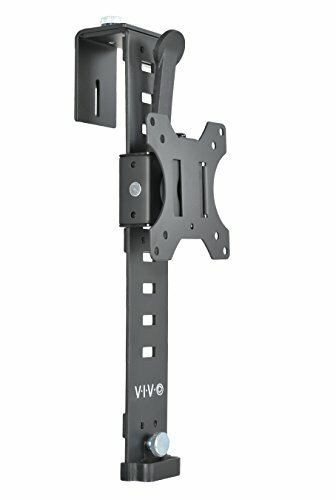 New Single Monitor Adjustable Cubicle Mount (MOUNT-CUB1) from VIVO. This ergonomic mount is designed specifically with cubicle work environments in mind. This mount will help maximize the available work space on your desk by mounting your display to the wall. Without monitors taking up valuable workspace, you can work more comfortably. With this mount, your computer's display can still be adjusted at a comfortable height which will reduce stress and strain on your eyes, neck, and back. MOUNT-CUB1 features multiple height settings for accurate height adjustment and a quick release mechanism to make adjusting your monitor's height an easy process. The width of the hanger is also adjustable between 1.75" and 3.5", enabling the mount to fit a majority of cubicle walls. COMPATIBILITY - Fits screens 17" to 32" in size and up to 17.6 lbs in weight with VESA compatible 75x75mm and 100x100mm. The height of the entire bracket is 17"